A cast enacts Scheherazade's tales of love, comedy, and dreams. Scheherazade's cliffhanger stories prevent her husband, the cruel ruler Shahryar, from murdering her, and after 1,001 nights, Shahryar is cured of his madness, and Scheherazade returns to her family. 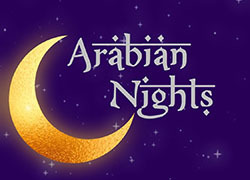 This adaptation offers a wonderful blend of the lesser-known tales from "Arabian Nights" with the recurring theme of how the magic of storytelling holds the power to change people.